US President George Bush says he will not be upset by mass protests planned for his visit to London next week. In interviews with UK journalists, he said: "I can understand people not liking war, if that's what they're there to protest. I don't like war." He said he hoped to meet the families of some of the UK servicemen who had died in Iraq, and praised Tony Blair. His comments came as UK troops in the southern Iraqi city of Basra stepped up security amid fears of attacks. When asked about the families of the 54 British soldiers killed in Iraq, President Bush said: "I am going to meet some. "There's two messages. One, the prayers of the American people and the prayers of the president are with them, as they suffer. "Secondly, that I will tell them that their loved ones did not die in vain. The actions we have taken will make the world more secure and the world more peaceful in the long run." However, the father of the youngest UK soldier killed in Iraq said Mr Bush and Mr Blair did not care about the deaths of British troops. Andrew Kelly,18, from Tavistock, in Devon, died in a shooting accident near his barracks in the southern city of Basra on 6 May. His father Robert, from Saltash, in Cornwall, told BBC Radio 4's Today programme he had not been invited to meet Mr Bush, and did not want to meet him. "For these people to meet families, it is only for their own gain," he said. 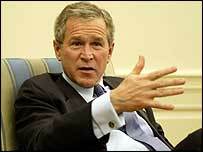 "What does George Bush care about our families and my family? He doesn't care." If the police are forced to stop demonstrators we will know that we are living in a police state and that democracy is dead . Turning to his relationship with Mr Blair, Mr Bush lavished praise on his "smart, capable, trustworthy friend". He said he was in "weekly" contact with the UK prime minister about the security situation in Iraq. "I admire him as a strong leader. He tells you what he thinks and he does what he says he's going to do. "And that's about as high a compliment as I can pay a fellow leader," he said. Mr Bush said Mr Blair made decisions "for the right reasons". "In my relationship with him, he is the least political person I've dealt with. And I say that out of respect. He makes decisions based upon what he thinks is right. "He's plenty independent. If he thought the policy that we have both worked on was wrong, he'd tell me." Mr Bush's three-day trip, which begins next Wednesday, will be the first full state visit by a US leader since Woodrow Wilson in 1918. BBC Washington correspondent Justin Webb said Mr Bush had agreed to a limited number of interviews with British news organisations "in the hope that his qualities, not always appreciated in Britain, shine through". Mr Bush said he was looking forward to staying with the Queen - even though he joked that he had to rent a morning suit for the formalities. "Obviously, staying at Buckingham Palace is going to be an historic moment. I never dreamt when I was living in Midland, Texas, that I would be staying in Buckingham Palace. "Buckingham Palace has got a resonance to it here in America which is pretty grand and pretty magnificent. I've been looking forward to it. "I've got my tails all set out and ready to go. Had to rent them, but - just don't tell anybody." Mr Bush may accompany Mr Blair on a trip to the latter's constituency of Sedgefield in the north-east. Asked if he would be able to understand the Geordie accent in the north-east, the president joked: "My Geordie is probably just about as bad as my English." When asked whether he would need a phrase book to understand the regional dialect, he replied: "Yes. They'll need theirs, too, I'm afraid." President Bush's comments on the planned anti-war protests came after UK Foreign Secretary Jack Straw said more British troops would be sent to Iraq if needed. Meanwhile, UK troops raised their profile in the southern city of Basra, following the suicide bomb in Nasiriya on Wednesday which killed more than 20 people. Numerous checkpoints have been set up, with soldiers conducting rigorous searches of traffic going both in and out of the city. BBC correspondent Paul Adams, in Basra, said: "Local people said the intensity was unusual, but they seemed to appreciate the added security - even though it caused gridlock on the streets." UK officials would not say whether there had been intelligence of a threat against any specific target in the city. "Mr Bush's visit is proving to be a security nightmare"